Intended Audience: Teachers, Daycare Providers, Coaches, Office Workers, new parents, or anyone who wants or needs to learn the life-saving skills of CPR and are not a healthcare professional (healthcare professionals are required to take the more advanced BLS Healthcare Provider CPR course, click here for more information on that course). Description: This class combines CPR, AED and First Aid Training in to one convenient session. Heartsaver CPR/AED with First Aid (as the American Heart Association classifies this course) teaches the skills necessary to recognize and provide immediate care for breathing problems, cardiac emergencies, injuries and sudden illnesses until medical personnel arrive. Participants will be certified by the American Heart Association for: Standard First Aid and CPR/AED for adults, children and infants. This course meets the Rule 2 and 3 requirements for childcare providers. Intended Audience: Teachers, Daycare Providers, Coaches, Office Workers, new parents, or anyone who wants or needs to learn the life-saving skills of CPR and are not a healthcare professional (healthcare professionals are required to take the more advanced BLS Healthcare Provider CPR course, click here for more information on that course). This course can be combined with First Aid in one convenient session. Description: CPR (or Heartsaver CPR/AED as the American Heart Association titles this class) gives individuals the knowledge and skills necessary to recognize and provide basic care for breathing and cardiac emergencies until advanced medical personnel arrive. 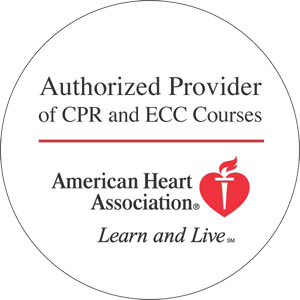 This American Heart Association course meets the MN Rule 3 Childcare laws and certifies individuals in CPR/AED for adults, children and infants and is valid for two years. An AED, or automated external defibrillator, is a machine used by responders to deliver an electrical shock to the heart when there is a cardiac emergency. When used with CPR, AEDs greatly increase the chance of survival from heart related emergencies. AED certification and training is included in all of our courses. Intended Audience: This class is designed for both Healthcare Professionals and Lay Responders alike. Anyone who wants or needs to learn how to respond to an emergency should take this course. First Aid can be combined with CPR in one convenient session. Description: First Aid covers any emergency that does not require the use of CPR. Topics covered in this American Heart Association course include: Recognition and treatment for heart attacks, stroke, diabetic emergencies, allergic reactions as well as first aid treatments to wounds, fractures, burns and other common injuries. Our workplace and community CPR, AED and First Aid courses are designed for any lay responder or non-healthcare employee. Perfect for office employees, teachers, daycare providers, new parents or anyone who wants or needs to learn the life-saving skills of CPR and First Aid. These American Heart Association classes are offered in classroom, online, and on-site for groups of any size. Classes are taught by experienced professionals for the lowest available prices. Looking for classes designed for healthcare providers? Click here for more information. Interested in getting certified online please click here for more information.